Stamp a Sweet Impression: Top Chef Winner! We got so many awesome entries for another round of the Top Chef contest - wow! Thank you so much to everyone who entered! We just love to see what you create with SASI stamps. I had the tough job of picking a winner and we're featuring her and the winning creation here today! So let's hear it for Rachel Sztonyk. Congratulations, Rachel! You get to choose a FREE stamp set from our latest release! This is Rachel's winning Top Chef entry. 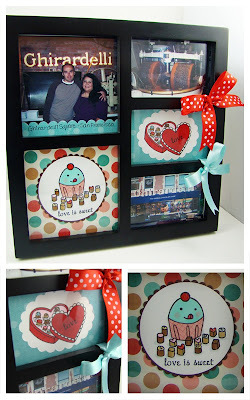 She showed the versatility of the Love is Sweet set with her cute and creative Ghirardelli creation. It's making me crave a big 'ole chocolate bar... or maybe a sundae with some Ghirardelli hot fudge. YUM! OK... now it's time to stop drooling and go visit Rachel's blog: Gingerbread Gallery and her SCS gallery! Thanks for stopping by today! Don't forget to check out the TE Store for all the new stamps and products released yesterday! And hop on over to my blog to join in our 1st Birthday Celebration! Hope you all have a wonderful weekend! this is so cute! what a fun keepsake! Yeah! Congratulations Rachel! This is simply AMAZING!!! YOu go girl!! CONGRATULATIONS, Rachel!! What a GORGEOUS project!! Congrats Rachel!! Love your gorgeous creation!! So yummy looking!! What a fantastic project! Congratulations Rachel!! !